The scene of yesterdays horrendous traffic jam involving at least two pickup trucks and multiple ducks. Please scroll to the bottom for the release of the last five ducklings. To say that they are reluctant to experience freedom is an understatement. More like your 30 year old offspring who lives in your basement. Our county (Montgomery) in their all-knowing wisdom decided to make the ditch on the other side of the street from our home incapable of draining. I think I know the problem and the solution but nobody is listening. The ditch across the street from our home was dug a little too deep and cannot drain. It needs to go down the street where (somehow) it should head off towards Caney Creek. When we are not suffering from drought that ditch stays very full of water. It has led to the demise of many a young duck who had to play in the traffic before and after going for a swim. Yesterday in one of those times when I chose to work outside, I heard a pickup hit the brakes and then sound the horn. I didn’t think much of it because most people driving by do not really want to hit the ducks. Hitting one at speed could possibly cause damage to your vehicle since these male Muscovies are the largest ducks in the world. Most people simply don’t want to kill one whether big or small. Then the driver and a passenger jumped out of the truck and I thought I had encountered a ducknapping in progress. I shouted to let them know I was a witness and proceeded rapidly in the direction of the duck. As I grew closer I realized that there were small specks trailing right behind the duck. She had a flock of babies that she had taken for a bath and the cowboys in the truck were just (I think) being good citizens. A professional grade baby duck catchers kit. After the duck was safely off the street and on our property I thanked the guys for stopping and rushed back to the house. I grabbed a milk carton and some newspaper to line it and shouted for my partner in crime. Sally is always seeking adventure of this type so she quickly followed me to the driveway and we corralled the babies and put them in the crate. Mama Duck had by this time come to the realization that she no longer trusted me and she was creating a fuss. As we proceeded towards the large cage on the front porch carrying the babies, she followed quickly. At one point she jumped two feet into the air and I have never seen one of this lazy bunch do that before unless they were initiating flight. Babies first picture. They were somewhat camera shy after the kerfuffle. When we had the babies in the cage it was time for mom. Obviously this picture shows her in the cage as an accomplished feat but it was much more fraught with danger than you can imagine. Let me describe a scenario that happened just last week. Before I go on, just take a moment to look at the claws on the foot of this little lady. Grangerland's version of apartment dwelling. When I worked for a short time in real estate I came to wonder what some people were thinking. You could give them everything they asked for and they still were not happy. This picture exemplifies the problem as I saw it. All these chickens have nests every bit as good as those occupied by the duck. Yet we sometimes see two or three chickens sitting on top of the duck. This leads us to a point that has chicken eggs and duck eggs in the same nest. We have to remove the chicken eggs or they quickly are not fit to eat. Eggs normally keep very well but not if they are fertile and under a broody duck. If Sally finds the duck off the nest and feeding, this is easy. Sometimes the duck delays which delays Sally as well. 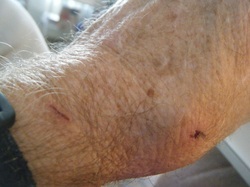 Grievous injuries from a duck attack. Be brave. Sally asked me to go get the duck off the nest and get the chicken eggs. I asked her why she hadn’t already done so. She said she'll bite me, you do it. Obviously this set off alarms. I asked her why she didn’t think the duck would peck me. She responded that I could take it with that "My Hero" look smeared all over her face. Now I have seen Mrs. Goose pull that on Mr. Goose and the knothead falls for it all the time. So did I. Now I must say that this is a most grievous injury but I will survive. If you are squeamish do not click the picture to make it larger. I guess I just have a high tolerance for pain. I am a veteran you know. Perhaps there might also be a high gullibility factor. Once bitten twice shy. You must hold a muscovy down and get a good grasp from behind if you are going to avoid their claws (yes, they have claws, review above). I grasped her firmly and put her in the cage. A little less camera shy. These little critters are going to be growing like bad weeds over the next 2-3 weeks. They will actually be growing for quite a while but the next 2-3 weeks will be the time of most rapid change. I feel compelled to chronicle that growth and development like we did the parrots. I will also give you the benefit of my Muscovey wisdom and tell a little about the breed. There are some real differences but my favorite is that they are a quackless duck. Search YouTube for duck stampede. You get a whole page of results from that search and I don't need that sort of noise here. The goose provides plenty all by himself. A full grown male muscovy. Probably the mate of the one in the crate with the chicken above. Watching and guarding. Hard to believe that some of these little critters are going to look like this when they are all grown. It’s true though. In fact this one is neither our largest or ugliest. The nodular red caruncle is a peculiarity of the male muscovy. The female has a dainty red mask. I hope this continues to be fun but I don’t get the benefit of creating the story. The ducks are going to do that. We expect to have at least two flocks to combine when they are all about the same size. I do not know how long the second duck has been setting on those eggs. It is possible that there is a third one somewhere. The last time they all were laying in the same place there were 24 eggs that hatched. As I said, I only get to relay the story. I don't think you can tell so easily as looking at them in person (or in duck) but 3-4 days means a lot. If you click on this picture it should grow which might be helpful. They have grown but it won't be so easy to see till they get over their fright of all things human. I'll be putting these up a couple times per week. We had a good reason to reduce the size of our flock of birds and I guess there is more than one way to do so. I am not happy with the first attempt I made. We had Mama Duck and eight Ducklings in a cage. We were feeding them chick starter in an effort to get them big enough to fend for themselves. Since it is going to be Easter Sally came up with the idea of selling them at the feed store. I found that the whole procedure was not as easily done as anticipated. Mama Duck left her calling card. The scratch was not the worst thing about this. After I delivered the ducklings to the feed store on Friday I was treated to a magnificent display of grief by Mama Duck. You can tell me that animals do not experience grief or loss if you want. I know you are wrong. Ex Mama Duck sat on the fence and stared at the cage. If there weren’t enough she spent the night sitting on eggs laid by that absentee parent Mrs. Goose. The next morning when I came out I found her sitting under the cage looking forlorn. Well two babies equals zero population growth. Sally was out of town and enjoying her newfound freedom as the owner of a car with an automatic transmission. The responsibility to be hard and do what was needed was all mine. I came unraveled like a cheap suit. I decided I would go reclaim two of the babies from the feed store. Look at the growth of these two kids. Getting them into the cage was very easy. The hard part was convincing Mama Duck that I had her best interest in mind. I spent a lot of time trying to corral her and was unsuccessful. After she returned I finally got Sally to help and we trapped her with a pincers movement. She resisted with a force that you would never have dreamed. Since I probably outweigh her over 200 pounds I managed to prevail. I spent some time reflecting how happy I was that the duck didn't weigh 30 pounds. Edit: I hate to come back to this so soon but there have been scurrilous claims about my behavior when recapturing Mother Duck. The hurt that this can cause has been compounded by the fact that it is my own dearly beloved who is spreading these malicious untruths. #1 I did not scream like a girl when the Mother Duck began to strenuously object to being placed back in the cage with her young. Actually she wasn't objecting to that. She simply thought I was approaching her with less than good intentions. #2 I was not spewing forth unintelligible gibberish. I was simply trying to tell Sally that the door to the cage needed to be opened so that I could contain the Mother Duck. Someone has to be in charge in extreme situations. #3 I was not being oversensitive. It is just that the mother of six should have understood the boiling cauldron of emotion with which the Mother Duck found herself beset. She had no business laughing at the situation. I hope this sets the story straight. If I reduce the size of the flock in the future I think it will be by giving them away. I think any deals with babies will include a parent. Springtime is coming and I imagine that once again there will be a normal attrition rate as they go roaming and do not return. So what did I learn. I reinforced my belief that if I had to kill my meat I would be a vegetarian. I learned that I am just as phony at being a farmer as I thought I was. I learned that I don’t like playing God. God is God and I am not. My cell phone doesn't have the camera I would like so you only see two ducklings listening to their mentor. Mr Goose is trying to tell them that everything will be ok. They aren't so sure. Two of them left yesterday and one of them caught his foot in some chicken wire. We thought something was broken but we were lucky. Young limbs are pretty flexible. Cannot tell today which one it was. Today I opened the cage again and Mr. Goose was in his element. "Come on out". With some help in making up their minds, they did. Bad grammar but they really seemed to have one collective mind. 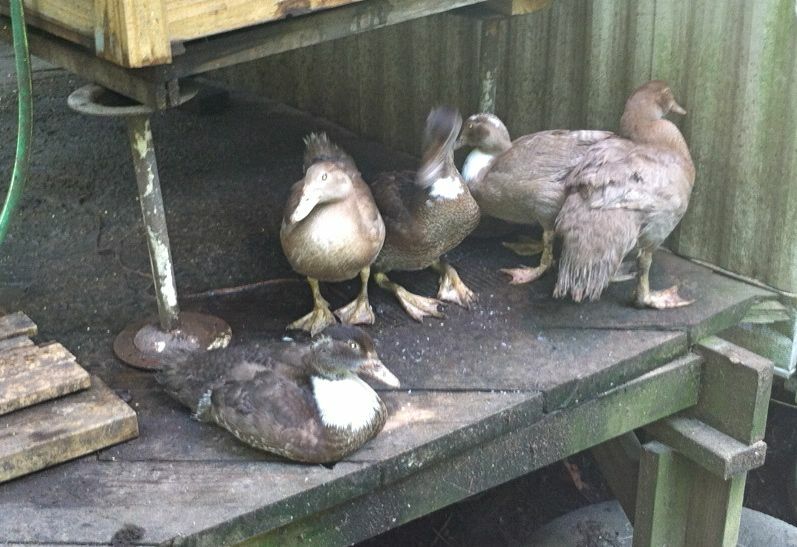 There are five ducklings under or around this cage. They will become more adventuresome. I spilled some grain under the cage and they got active with that. Then I turned the water on and they were really interested. Next they will slowly join the ducks of the flock with the introductory assistance of the Mommy that hung around and, of course Mr. Goose. In about a month I won't be able to tell the young males from the older females. Not real sure I can now. They sprouted while we were in Canada. We still have three young chickens that are about half grown and in a cage. They aren't going to be there for long. Next project is doing a series on the part of Canada that we visited. See you then. Lee and Sally Wilcox live in Jeff Foxworthy's world in Grangerland Texas. They have five acres and are owned by chickens, guinea fowl, ducks, 2 geese, donkeys, a llama, parrots, dove, parakeets and finches at last count.